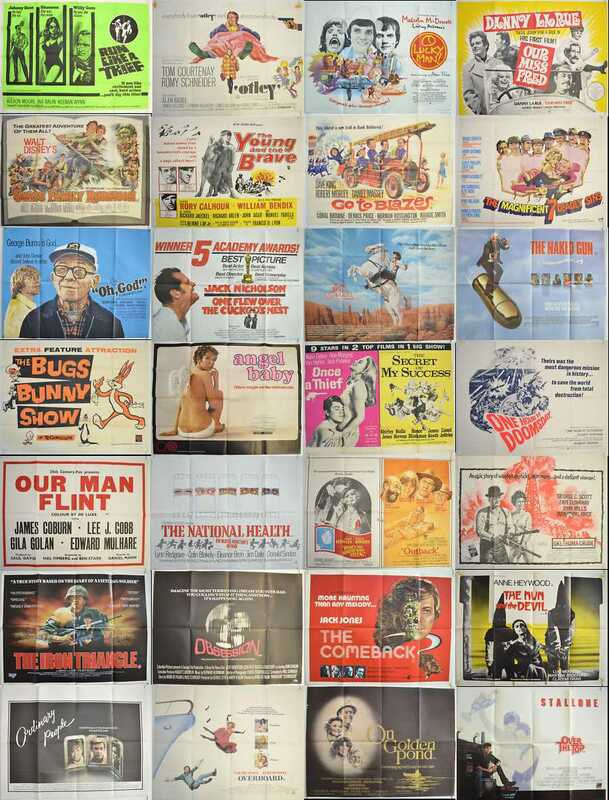 British Quad Posters - 60's, 70's, 80's - Go To Blazes (Chantrell), One Flew Over The Cuckoos Nest, O Lucky Man! This week I have yet more Original British Quad Posters mostly from the 1970’s and 80’s but there are a few 1960’s thrown in for good measure including “GO TO BLAZES” with artwork by Tom Chantrell, “SWISS FAMILY ROBINSON” (1960) starring John Mills and Dorothy McGuire, plus Tom Courtenay stars in the spy spoof “OTLEY”. From the 70’s I have the Jack Nicholson Academy Award Laden “ONE FLEW OVER THE CUCKOO’S NEST”, and the rare polychrome artwork poster for “O LUCKY MAN ! “ (I have the other version available to buy now at www.pastposters.com ), Also from the 70’s I have the horror “THE COMEBACK” featuring Jack Jones and Pamela Stephenson, Sci-Fi Disaster Movie “ONE HOUR TO DOOMSDAY” (a.k.a. City Beneath the Sea), and comedies “THE MAGNIFICENT 7 DEADLY SINS” (another Chantrell artwork) and “OUR MISS FRED” strarring Danny La Rue and Alfred Marks. Plus a great Double Bill for the Debbie Reynolds, Shelley Winters horror “WHAT’S THE MATTER WITH HELEN? / OUTBACK”. 1980’s fans might enjoy “THE LEGEND OF THE LONE RANGER”, “OVERBOARD”, “ONCE BITTEN”, “THE IRON TRIANGLE” or “ONCE BITTEN” featuring a young Jim Carey. There are over 40 to look through so you should just be able to have a quick browse during your next tea break!